Born Free is concerned to hear that villagers in India have thrown firebombs and rocks at a mother elephant and her calf to chase them away from their community in Bishnupur, West Bengal, north east India. Encounters like this in and around towns and villages throughout India are becoming more common as people try to protect their crops from elephant raids. South east Asia has one of the densest human populations in the world, increasing at 1-3% a year. Roads, railways and settlements carve up habitats and protected areas, causing elephant families to become isolated. This forces them to move through human habitation in search of food, water, or salt licks. 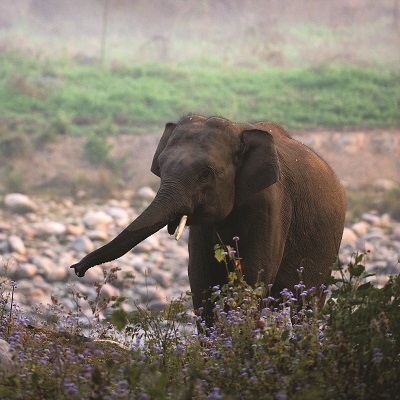 The Asian elephant was once widespread across India, but is now restricted to certain areas and numbers are decreasing, predominantly as a result of conflict killings. As elephants naturally range across huge areas, more than 200km2, to obtain the massive amounts of plants, grass and browse they need on a daily basis, they regularly move out of protected areas and into human-dominated landscapes. Born Free’s work in India aims for co-existence between people and wildlife. This is achieved by educating and involving local communities in conservation. Initiatives to reduce human-elephant conflict, such as using bio-fencing or sending out Elephant Guardians, are needed so that villagers can live in harmony with elephants.